It is a privilege, an amazing gift, to be able to accurately appreciate an author's voice and to faithfully and gracefully convey it in another language. I am a person with that gift, and with it comes an incredible sense of honour and responsibility. Whenever an author entrusts me with a book, they are granting me an opportunity to speak on their behalf, for them, as them. It is this feeling of being trusted with a precious part of someone's literary life - someone's dream - that inspires me, both in my work and on a day-to-day personal basis. We also plan to set up a readers' forum online, to encourage open, direct and civilised communication among readers regarding their favourite authors, books and literary topics. More importantly, we aim to publish more books of diverse and multicultural content, including a series of ebooks on Coding for Kids, initially in English and Chinese, combining our key skill sets, and involving our children's education. Our CTO and Managing Director Steve Goschnick has recently published articles on Coding for Kids at TheConversation.com (example here), giving some precursor of what's coming to eBookDynasty's range. 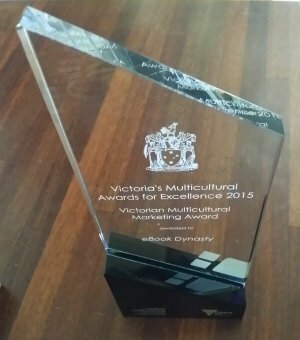 About the Photo: The 2015 Victoria's Multicultural Award for Excellence - Victorian Multicultural Marketing Award, received by eBook Dynasty. Photo credit: eBook Dynasty.